The Hostel AnauÃª is located in one of the most noblest neighborhoods of Foz do IguaÃ§u, with bus stop at 750 m that takes you anywhere in the city or a country located in the Triple Frontier (Brazil, Paraguay and Argentina). We are 11 km from International Airport, 12.3 km Iguassu Falls, 3 km from Foz do IguaÃ§u downtown and 4.8 Km from the Central Bus Station. The Hostel AnauÃª also offers excellent accommodation with breakfast, towels, bedding and free Wi-Fi. 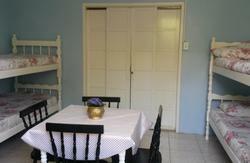 We have 42 beds divided in shared dormitories and private rooms and 10 bathrooms around the hostel. Our structure has a TV room, a lounge with sofas, swimming pool with pool bar and TV, 24 hours front desk staff that can assist and provide you information on tours and attractions in the City. Free cancellation up to 7 days before Check in, after that 50% charge. The Hostel AnauÃª is located in one of the most noblest districts of Foz do IguaÃ§u, near to bus stops, which takes you to anywhere in the city, or to any of the countries of the Triple Frontier ( Brazil, Paraguay, Argentina). Located in a unique position Pousada Quati Hostel offers its guests an unforgettable experience.